Jacques Ibert (Performer); Ensemble Barcelona (Performer); Jean Decroos (Performer). Friedrich Gulda (Performer); Ensemble Barcelona (Performer); Jean Decroos (Performer). Bohuslav Martinů (Performer); Ensemble Barcelona (Performer); Jean Decroos (Performer). 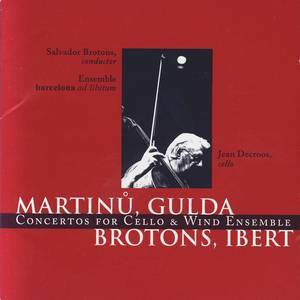 Barcelona Ad Libitum (Record Label); Salvador Brotons & Ensemble Barcelona (Artist); Jean Decroos (Release Artist); Ensemble Barcelona (Release Artist); Salvador Brotons (Release Artist).